Social activities include lunch runs, breakfast runs, annual events such as the Kimber Run and the Weekender, as well as the National Meetings and other social get togethers as arranged from time to time. Look for more information in the Calendar and the event buttons on this page. PLEASE NOTE: In order to better manage social events which have a limit on attendance it is requested that Club Members pay either the full amount or a deposit one week prior to the event at which time bookings will be closed. 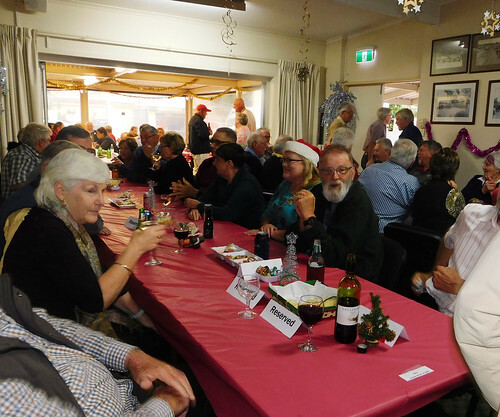 Up to 90 members and guests attended the Dinner in the Clubrooms on December 14th. Another excellent meal was provided by Aussie Ripper Roast including a tasty dessert. Santa made his usual appearance. He seems to have been on a bit of a diet and has grown a little taller over the previous 12 months. 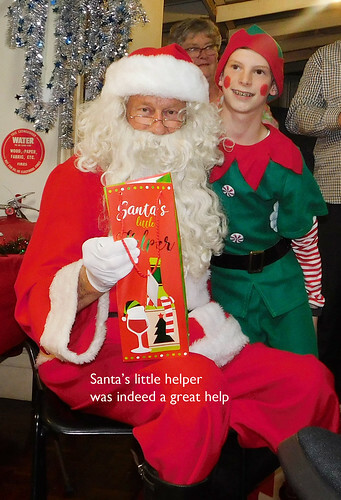 Santa was expecting the ever reliable Laurie Foody to assist with elf duties, but Laurie, being the gentleman he is, handed the role to Tyler Edwards for the night. Thank you to Tyler (a bit of a showman, perhaps a future in the acting profession) and Laurie. 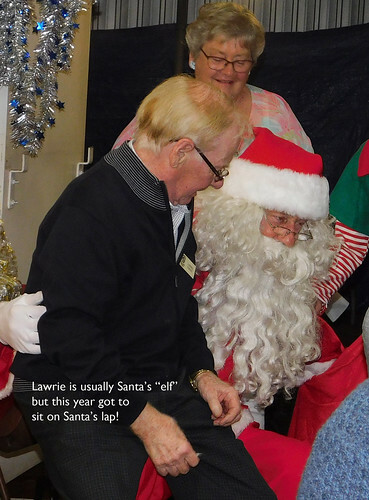 During the evening Santa drew the winners of the door prizes. I must thank David Evans (Spendless Shoes) for the donation of vouchers. These were by far the best prizes on the night, so if you need shoes, remember Spendless Shoes. All who attended had a good evening and thanks also to the many members who cleared up after the party and our ever reliable Berry and Peter behind the bar. Why not come along on a journey of discovery and enjoy a day in Strathalbyn and Langhorne Creek. We begin at 11.00AM at the beautiful and very old “Gasworks Cottages“. This building was established in 1867 to supply the town with street lighting, heating and coal. One of the oldest stone buildings in Strathalbyn and it played a vital role to the local community in its day. Did you know that the word STRATH means “A broad flat river“ in the Scottish language? After our time here we then motor on in our marvellous MG’s to visit Langhorne Creek, where we will be partaking Lunch at another well-known old establishment called Angus Plains Winery and Cellar Door. Both venues offer good parking and lovely Bed & Breakfast accommodation. So, why not make an overnight stay, or perhaps a wanderous week-end of it. The ceiling is 30 people only, so as usual, it is first in, best dressed, with a $10 pp deposit to secure your place. Prices and maps to follow shortly. The MG Car Club of SA (MGCCSA) encourages its members to organise events for and on behalf of other club members. This voluntary role is the backbone of our club and ensures that member participation in events is high. These guidelines are to ensure that the club member/s organising the event are not financially dis-advantaged and the MGCCSA is also not financially encumbered. It is expected that all events be cost neutral (or a very small profit made put towards other club expenses), and all costs of organising/running of the event be borne by the event participants. Any event that runs at a deficit will need approval from the MGCCSA executive committee. Any event being proposed by a member needs to a have a budget plan prepared and presented to the MGCCSA executive committee for ratification. The costs of organising/running of an event should be incorporated into a registration fee for the members wanting to participate in that event. * Petrol costs (not vehicle running costs or repairs). NOTE: traffic infringements by members are at members own expense. * Calls to Mobile Phones. These costs should be shown in a budget and claimed against that budget item. When a claim for expenses is made they are accompanied by receipts. The claim is prepared and presented to the Treasurer for payment. Authorised by the President and Executive committee of the MG Car Club of SA. Turning 65 doesn't happen very often, in fact only once in a lifetime. So... how does one celebrate to mark this milestone occasion? 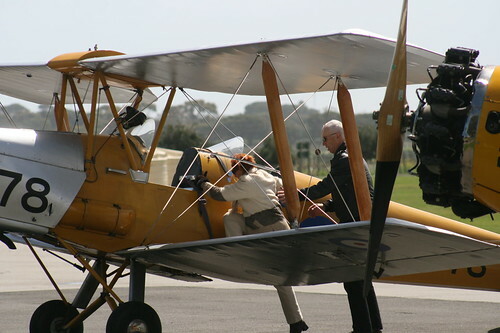 Well I've always wanted to fly in a vintage Tiger Moth, so that's it. My friend Sandy also had a significant birthday, so why not celebrate together? Very early one Sunday morning Sandy and I set off to Goolwa to rendezvous with Don Walker in his 1946 TC and Peter Shipside with Vickie in their 1955 TF1500. Nice weather to set off, albeit extremely windy, but coming down Willunga hill towards Aldinga Airstrip the weather looked anything but welcoming, especially for flying vintage bi-planes. Our estimated take off time of 11 am looked rather doomed, but then, as luck would have it, a break in the weather. Oh, I forgot, I told Don that he too will be coming with us, his face was something to behold, not too sure if it was terror or excitement that came to the fore, perhaps a combination of each. I requested the 1939 built Tiger Moth, Sandy the 1946 Stearman and Don was treated to the fairly 'new' Great Lakes. What I didn't tell Don was that the Great Lakes is fully aerobatic and like a Formula 1 car in the air! The strong head wind allowed us to take off after only a very short distance on the grass strip, then off into the wild... grey..... yonder. But lo, the skies cleared enough for us to do spectacular formation flying in various poses, left, V formation, right V formation and line abreast, or something like that. 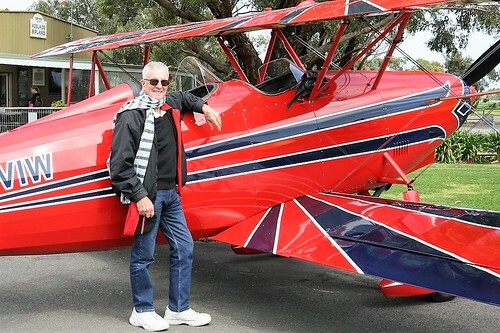 Meanwhile Don had gone off for, unbeknown to him, a spot of aerobatics over Maslin Beach. Safely back on the ground and I can't wait for the next episode, whilst this time it will be 'moi' in the Great Lakes with aerobatics unlimited! Now, where was that Hispano Suiza?? Once again, we started off the year's breakfast events with our annual visit to Christies Beach Sailing Club, and were blessed with a perfect summer’s day. The Sailing Club is open to the public on the first Sunday of each month; and for $15 a head you can have a full cooked breakfast with bottomless coffee, juice, and endless toast. It is well worth a visit. It is a "make your own way" there affair with the MGs parked on the foreshore, however some of our regular parks had unfortunately been taken by members of the public. Once again, we had a very good turn-out of members and guests, including the Rea’s, first timers John & Helen Tamke in their lovely MG RV8, plus Alan Grundy and his wife in their very nice, restored, 1949 MGYA recently purchased from an Eastern States Motor Museum. John Roach arrived in his newly acquired white MGB GT. A “barn find”, but a sound car, that had been in dry storage for some 30 years, and for which he has the original UK Sales Document and Service Logbook! Alan & Ros Foweraker unfortunately were a little late in arriving due to a fuel pump problem. 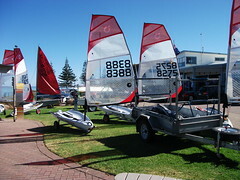 The start of the year's breakfast events was our annual visit to Christies Beach Sailing Club. They are open to the public on the first Sunday of each month; and for $15 a head you can have a full cooked breakfast with bottomless coffee, juice, and toast (if there is such a thing). So they are well worth a visit. There is no formal run involved, it is merely a make your own way down, park the MGs on the foreshore and get together for a long breakfast, to watch the world and yachts go by. As you can see we had a good turn out of members, and we were lucky enough to be bypassed by the rains all morning, and thanks again to MGCCSA and CBSC member Marc Read for the invite. Ron Lewis & Julia,	just passing through to say hello. We had sixteen members to the Movie Night. The “F” boys were there, but all had seen ”Last Cab to Darwin”, so they had a natter in the verandah and left for their usual coffee before supper. Missed out on cake and a couple of other delicacies boys. The movie was not what I expected, but it was certainly watchable. Some humour, some sadness and a bit of a message about relationships. Too heavy for Alan; the only highlight for him was the race between the cab and the train - the cab won. Thanks to everyone who supported the Movie Nights throughout the year. I think that it might be a good idea to have fewer next year. I would like to hear from anyone who has a movie they think would be suitable and is prepared to organize. We had a Pig-on-the-Spit BBQ on the Saturday evening as a fundraiser for the 2017 MG National Meeting. The master BBQ'er Mick Mitolo used his magical skills in sourcing, preparing and cooking the magnificient looking pig. With plenty of roast pork, there was additional pork rolls and chickens to eat. Also there were lots of salads and bread which ensured that you were never left hungry. After the 1st course there was enough left for seconds. If this didn't fill you up then there were continental cakes for dessert. Given the short notice and other club activities, we had 80 people attend, this made the night a rousing success. Many thanks to the MG club members who attended, and a great big thankyou to Mick's family, friends and Rotary club colleauges, whose presence added to the atmosphere of the night. After expenses we were able to contribute a sizeable amount towards the 2017 MG National Meeting. Tim Edmonds spoke to the people attending about the events and activites of the 2017 MG National Meeting. Allan Semmler also spoke about the club and thanked all for supporting the BBQ and to those helpers on the evening. Many thanks to all those who helped; Sandra, Wayne, Geraldine, Berry, Mathew, Allan, Raelene, Bev in setting up tables, putting out food and clearing up. Our Club was founded in 1966 and will achieve it’s 60th year in 2016 so the committee has agreed that this milestone should be celebrated in some shape or form next year, how and when have not been decided, so we are calling all members to submit your thoughts on just how we should celebrate this milestone. Seeing as I am writing this I am going to submit my personal ideas on what I believe would be more than an appropriate event, that is something we have not had for a number of years now, a Dinner Dance, held at a venue in a central position, with a big dance floor, a 60/40 band and catered. Every year we stage “Car” events, The Kimber Run, occasionally a Show & Shine and now and then Weekenders, so what about a “People Event”. While I do not enter many of the Car events, my MG spends most of it’s time on the race track because I love driving my MG fast, but I also love dancing!! Now I am calling on all the Ladies members ( that is if you also like getting dressed up dancing as well ) to support my proposal, if enough members do this to make it financially viable I will coordinate the event. We will review them and the committee will allocate the “when” as there will most likely be a number of events that would be accepted. Welcome to the Wags' Page. We hope you will enjoy the following articles. Further to the February Wags article, we have received the following email from an MG enthusiast in Perth advising of two Australian "Dancing Girls"!. As well as being a life member of the MGTC Owners Club here in Perth I am also a member of the MGCC SA and I have just been reading your article MG WAGS in the latest magazine and I am wondering if you are aware that two of the team of six ladies at Le Mans in 1935 came from Australia. One, Joan Richmond, was a Melbourne girl and the other was Colleen Eaton. At the National Meeting here in Perth last year one of our Club members won the Joan Richmond Trophy for best performance in a T Type and our Club had the pleasure of presenting the trophy but not before doing a lot of research. Joan who passed away in Melbourne as recently as 1999 had a remarkable career in motorsport in Aust initially and then in England and Europe in the 1930’s cut short, like so many things, only by the start of the second world war. Colleen was not so well known but was all the same a very accomplished and successful race driver as were the remaining four team members. They did not share the same car at Le mans in 1935 but the car Joan drove to cross the finish line as the first of the three still exists in restored condition and was sold by Sothebys for the second time in the last few years for around 120,000 pounds. There is a lot of information about the team and the 1935 Lemans on the net and Joan Richmond has a web page that is well worth a read but maybe you know that already. Recognising Joan with a perpetual trophy was well deserved and Joan’s career is a good talking point when trophies are being presented. Whilst talking with Geraldine Hough at a recent breakfast run , my eyes were drawn to a very colourful breakfast pastry that she and Wayne were enjoying. She has kindly shared her recipe for these tasty treats which are quick and easy. Ideal! Cut pastry into 4 squares and ease the squares as a lining into the muffin pan holes leaving some up the sides. Slice the pancetta into bite sized slices and twist into the pastry cups. Put in the oven for 10-12 minutes until the pastry starts to turn golden. Take out of the oven, sprinkle some basil over the tomato and then carefully crack one egg into each pastry cup (it is easier to break the egg into a cup and only pour the yoke and enough white to fill the pastry case as sometimes large eggs overflow! Return to the oven and cook for 5 minutes more - check if the egg white has almost set and cook a minute or two more if not but try not to burn the pastry edges. Remove from the oven. Season to taste. Sprinkle grated cheese and basil on top, if liked, then allow to cool slightly in the pan as this sets the pastry base slightly. When cool, these can be stored in a sealed container in the fridge until needed. The same method can be used with cold chicken and cooked potato pieces and/or tomato pieces and a few cooked peas - can even add small pieces of stuffing - drizzled with cream before cooking then seasoned and sprinkled with grated cheese and parsley or basil. (These can be frozen when cold for use on a picnic served with redcurrant jelly.)" We had a large number of MGs participating in the McLaren Vale Vintage and Classic car event and were very fortunate to be leading the car procession this year! Our group enjoyed the time at Penny Hill Winery, with great food and Wine! The long tables provided by the winery allowed for members of the MG Car Club to sit together and enjoy the atmosphere and the vintage aircraft flying overhead! We had new car club members joining the group and it was great to welcome them! Photo of Judy Glasson, Sandra Cardnell and Sue Gilson enjoying a very large White Wine at Penny Hill Winery on Sunday the 2nd of April. A reminder for the Kangaroo Island 22 October 2017 MG Weekender! We still have some availability at the KI Seaview Motel and would recommend booking soon to avoid missing out on a great time! Trust you are all into the swing of 2017. Many of us, of course, are working towards a successful National Meet at Easter right now. Please make best efforts to support the club at this time by registering to attend and/or volunteering. Whilst Googling with such search terms as "MG and lady drivers" or similar; I happened upon the following story of famous women in motor sport in the 1930s. Thought I'd share the following with you! Girl Racers of the 30’s. Into the mid 1930s gloom, a world locked in the Great Depression, on the brink of war, came Eyston's "Dancing Daughters". These talented girl-racers were part of a deliberate marketing strategy by MG, in 1935, to market the handling and reliability of the PA Midget via participation in the gruelling Le Mans 24 hour race. Women's relative rarity on the racing scene was just what the MG advertising office could exploit. Lacking today's technological advances; the Le Mans was a really mean beast then. For example, there were no modern communication links between teams and their pits and especially trying was the night driving with headlamps less powerful than a small torch. Three Eyston-coached women-only teams entered the race. (Geo Eyston was a contemporary racing star). The results were sensational, they all finished the race (a feat in itself), and the fact that WOMEN could drive them and at NIGHT! Well, the Midget must be invincible!! However, it took the Dancing Daughters' superb driving skills to truly highlight the features of the car. The marketing deal with the girls and MG worked both ways. Being sponsored by a major marque certainly enhanced their future racing careers and certainly did no harm to the sales of the PA Midgets. PA Midget Taking tea before the off! The 3 LeMans MGs & fashionista in overalls and high heels! Ciggies to settle the nerves before the LeMans race. If you have any submissions for the Wags' Page; please email: Barb Harrington at barbandsteve22@iprimus.com.au marked "Wags' Page "
A warm wintery hello to our WAGS’ readers and hoping you are surviving the very chilly cold and rainy days! We have an amusing submission from Barb Harrington taking us back to her deportment class days. Thank you Barb for your submission. We also have an article from Geoff Glasson. Cheers to Geoff as he is the first male to submit an article to us. Sometime in my mid-teens, my mother deemed it necessary that I be brought up to speed in such matters as deportment, grooming, elocution and hostessing. Hence, my enrolment for six sessions at Mrs Jaye Walton's "Touch of Elegance" (you may remember her as the hostess of a TV show of the same name). During a recent de-clutter, I found my lesson notes from this sixties "charm school". "How to dress if you are a PROMINENT CITIZEN'S WIFE"
"Always remember to keep a SPARE pair of gloves in your handbag"
"Suggested hairstyles for a nose that is a TRIFLE long"
"A lady NEVER wears slacks to a meal table (except her own)"
"If an UMBRELLA is used as a walking stick; hold in palm with finger pointing down"
"You should ascend stairs like a bird in flight and descend stairs like a cloud drifting"
When meeting Governor, curtsey to him, step back and bob and shake hands with his wife . When meeting the Queen, address her as Your Majesty, then "Ma'am". When meeting the Pope, address him as Your Holiness, then kiss his ring . Can you imagine us all meeting any one of the above – I do not think so! Bishops are to be addressed as My Lord, Archbishops as Your Grace. Perhaps the one with the greatest relevance to us WAGS is the following on how to get in and out of a car. "Look at seat, turn self around and put seat in first, pivot on seat and swing both legs together into the car. Reverse procedure to get out"
Mrs Walton did concede that she had no elegant solution concerning the coming and going from the rear seats of Minis and other two door cars! Let us know if you've found something interesting, comical or quirky when de-cluttering. Now from Geoff .. .. .. ..
On Judy's and my return to Adelaide from the Yarra Valley 2015 Nat Meet, we had to call into Millicent. The wife was given the job of booking accommodation for the night via her wiz bang communication tools. Nelson on the Glenelg River was chosen, a phone call was made after searching information from the wiz bang brand new iPad. The booking was made and seeing that we had phoned, we received a discount of some $50 for accommodation overlooking the water and we said we should be arriving by 5 p.m. Later on near Portland it was decided to ring and advise we might be a little late. Out with the wiz bang iPad to find the phone number again when Judy said “what does NZ mean after the phone number?” Yes love I think it’s for New Zealand and it was!! Another phone call to NZ to say we would not be there tonight because we were in Victoria, Australia ..... Soooo sorry! We dined at the Nelson Hotel that evening and found that we were not the first to ring Nelson, NZ instead of Victoria. All ended well with memory erasing red wine. To finish this edition is this famous quote by Henry Ford... ..
Our edition this month features an editorial about Holland America Shipping Line’s new ship and another Parisian Walk taking you up to the hill Community of Montmarte. The big news is Holland America Line launched their new ship MS Koningsdam, a a mid size ship carrying 2,650 guests and weighing 99,500 Gross tons. Her Majesty Queen Maxima of the Netherlands launched the vessel from Rotterdam on May 20, 2016. She serves as Godmother to the Koningsdam. Holland America Line have a rich Dutch heritage and fly the Dutch flag. The company began in Holland more than 143 years ago. The security on board for the launch was major and enormous screens were placed around the ship for all the passengers to enjoy the festivities! The ship has 13 Guest decks and was designed by legendary architect Bjorn Storbraaten. The architectural theme is music inspired with innovative new restaurants and entertainment venues. One of the outstanding features is a World Stage which has a two story, 270 degree high definition LED Screen that wraps around audiences giving to them an amazing sight and sound experience. Imagine a raging fire on the screen wrapped all around you with the sound technology that is possible today. Continuing the travel theme, we would like to take you on a 90 minute walk to Montmartre. You can always see Montmarte high on a hill in the distance. The walk begins at the base of the sandstone butte (hill) where old theatres and dance halls once existed and as depicted by painters from Renoir to Picasso. It continues steeply uphill to the original village, along streets which still capture the atmosphere left by artists like Van Gogh. You then wind downhill to end at Place Blanche. The Moulin Rouge cabaret is near here. Montmarte and art are inseparable. This has been the case for 200 years. By the end of the 19th century the area was a haven for artists, writers, poets and their followers. Many of the artists and writers have left the area but the night life remains, although of a seedier character. Strangely the Butte still has a physical charm and a village atmosphere remains especially around the old village square the Place du Tertre which is packed with easels and painters and also in front of the Sacre-Coeur church. If you walk around you will find tiny exquisite squares, winding streets, small terraces, long stairways plus the Butte’s famous surviving vineyard where the few grapes are harvested in early autumn. There are amazing views of the city from various points, especially from the monumental Sacre-Coeur. A piece of trivia is A La Mere Catherine was a favourite eating place of Russian Cossacks in 1814. They would bang on the table and shout “Bistrol” which is Russian for quick, hence the Paris Bistro was born! Tips for walkers, starting point Place Pigalle. The walk is 2.3 km and goes up some very steep streets to the top. You can take the Montmartrobus which starts at the same point. The nearest metro is Pigalle. There are many cafes and shops to enjoy along the way! We have included below a wonderful French Recipe created in the hotel Tatin in the Loire Valley. Tarte Tatin, which is an upside-down pastry in which the fruit are caramelized in butter and sugar before the tart is baked. Step 1; Preheat oven to 220°C/200°C fan-forced. Grease a 6cm-deep, 20cm (base) round cake pan. Line base with baking paper. Step 2; Melt butter in a large frying pan over medium-high heat. Add apple. Cook, turning, for 3 to 4 minutes or until golden. Add sugar and 2 tablespoons cold water. Cook, stirring, for 2 to 3 minutes or until sugar has dissolved. Bring to the boil. Reduce heat to low. Simmer for 2 to 3 minutes or until slightly thickened. Step 3; Arrange apple in prepared pan. Spoon over sugar mixture. Cut a 22cm round from pastry. Place pastry over apple, tucking in at edge. Bake for 12 to 15 minutes or until golden and puffed. Stand in pan 5 minutes. Turn out onto a plate. Serve with cream. WE NEED FURTHER WAGS’ ARTICLES TO SHARE! MONARTO ZOOLOGICAL PARK – THE PRIDE OF SOUTH AUSTRALIA from Geraldine Hough. When Wayne and I joined the friends of the Adelaide Zoos recently, we noticed an advertisement to join the volunteers at Monarto Zoo for a Progressive Dinner in early April. Since we were celebrating 44 years of marriage around that date, we thought it might be a nice way to celebrate. Arriving at the zoo at 4:30pm, just before public closing time, we were taken almost straight away to the Chimpanzee area for canapes and pre dinner drinks. We were provided with lovely food and a talk by one of the keepers about the life of the chimps in our zoo, as they prepared to bed down for the night. On the way to the lion and hyena area by bus, we were taken through the giraffe enclosure where they were busy with their own dinner. The soup course (2 different flavours with bread rolls or bacon pastries) was served when we arrived at the lion viewing area. One of the largest prides in Australia, we were able to see them coming out for the night’s entertainment – fortunately that did not include a human appetiser! At the lion enclosure, the lionesses were all out for the night, a great treat as they know that they will receive a reward of turkey necks from the keeper, one per each lion. We were told that the boys are kept separate as there cannot be no interbreeding as they are quite closely related. The lionesses then received their reward, for which they had been eagerly waiting. The wild dogs and hyena area is adjacent to the lions, so we able to watch the latest “pups” (is that the right term??) and their parents – while one of their keepers threw biscuits for them to chase. All the hyenas in the Australian Zoos were bred at Monarto, so we have a very successful conservation programme for them. The hyenas like nothing better than being tickled under their chin by the keepers – just like our own pets. By then, darkness had set in, and we were transported by bus back to the Indaba Camp. This is an area set up for school visits and educational meetings. The main course included roast beef, chicken and all the sides of salads and roast vegetables as well as vegetarian offerings. Wines and beer were served generously at each stop. Good job Wayne was the designated driver! The last stop was at the Waterhole Function Centre near the giraffes, but by this time, they had retired to sleep. Dessert course, a huge variety of cakes, slices, pavlova, fruit and cheeses, was served together with tea, coffee and port wine. After dinner, we were driven back to our cars at around 9:30pm, to make our way back home. An absolutely fabulous experience! We hope to be able to go to some of the other “Behind the Scenes” events put on by the hard working volunteers over the next year. We can thoroughly recommend these events if you are thinking of celebrating your own special date, or just for the love of animals that are so very threatened in their own homelands on the African continent. 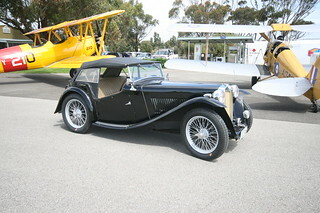 We also recommend Monarto as a lovely destination for a nice MG run and lunch in their bistro. This month we feature Denise Murison's inspirational piece on her MG-filled life and very importantly, the special affection that her son, Tim, has for the car. MG's even feature in her quilting projects; see photo above! It has been great to meet Denise and Tim on several runs, and we very much look forward to future events with them. Also, in upcoming issues; Geraldine and Waynes' zoological feast and Geoff Glasson's racing tip! The Life of my MGB. My name is Denise Murison and I am going to tell you a little about myself. I came out to Australia with my family as a 10 pound Pom back in 1963. We settled in Sydney. I went to High School and TAFE in Sydney. In my younger years my Mum drove an MGB. This is probably where it all started. I have worked with Special Needs Children most of my life starting in a centre based at Holsworthy Army Camp. This is where I met my husband Wayne. It was April 1986 and he approached me one afternoon asking me if I wanted to sell my MGB which I had not long purchased. Of course I said no. I would take him on the weekends looking for an MG to purchase when we found one. After a few days we went to pick it up and it was pouring with rain. I remember giving Wayne a towel and telling him he would need this, which he did. The spark grew from there and we would often flip a coin as to which car we would drive on the weekend. Wayne was in the Army so we moved to many places but the 2 MGs always came with us to Canberra, Albury Wodonga and Adelaide each time, either on a trailer or a truck the cars came. Over the years we married and started a family and my MG was sold for a family car. The other MG went in the garage and that is where it stayed for many a year. Then in 2011 it was decided to do some work on it and register it again. We have a son (Timothy) with Autism and he loved the MG. Whenever Wayne took the keys off the hook in the kitchen, Tim would be there asking for a drive. Then in 2012 my husband got sick and passed away. I couldn't look at the MG or go near it for a very long time. It just sat in the garage collecting dust. Then a friend of mine asked me to sell it to her. I did seriously think about this and then thought about all the wonderful memories we had in the car and decided it needed to be used not stuck in a garage. If I was going to drive it more then I needed to join a club. So I joined the MG Club SA. Through the club I was able to get Historic Registration and the people there are always pleased to give advice when needed. I found a fantastic mechanic, Allan Foweraker, who has been wonderful in getting the car purring perfectly. Thanks Allan. The first photo is off my 1972 MGB and the other 2 are the MG that I drive now. These were taken the day it was bought in 1986 back in Sydney. I attend as many morning runs as I can and Tim comes out with me on these and loves them. A big thank you to everyone for accepting Tim as he can be very loud sometimes and in your face. He always has a smile when he hears the keys and is a willing passenger for a drive. So as I write this I realise that this car has been in my family for 30 years and will be for many more to come. We hope you are enjoying the start of the wonderful autumn colours in the wine regions and of course in The Adelaide Hills! We have a book review which is well timed with the impending Rio De Janeiro Brazil Olympics, August 5–21, 2016 and also some Wedding pictures from our daughter Holly’s Wedding on March 13th at Mount Lofty House. BOOK REVIEW:"DANGEROUS GAMES. Australia at the 1936 Nazi Olympics" by Larry Writer. Published by Allen and Unwin, July 2015 (This book is in the library system and available also in large print). This was a great read on so many levels; 33 young Australian athletes and officials found themselves in 1936 Nazi Berlin, at the epicentre of Hitler's 3rd Reich. The historical context of the Games was not lost on the athletes. Several rubbed shoulders with Hitler. The pageantry, architecture and military pomp screamed Nazi ambition. Top-ranking Nazis vied to host the most extravagant parties. Hitler had directed that the public must appear happy during the two weeks and anti-Jewish public signs were taken down, just for the Games duration. These were also the Games of such notables as the American Jesse Owens (fastest man in the world) and Leni Riefenstahl (Hitler's famous film-maker). Despite their fine athleticism and enthusiasm, the Antipodean sportsmen and women were so ill-prepared and badly informed by their officials, to take on the might of the rest of the world. There was much to be learnt by Australian sporting bodies as a result of these Games. For example, the Aussie track and field athletes competed in yards, but European tracks were in the metric system. Also the Europeans used cinder tracks unlike those at home (resulting in several shin injuries). Aussie swimmers competed in salt water whereas the Olympic pools were freshwater. Our pugilists fought bouts to different rules and so it went on. The Aussie contingent was amazed to behold the "tough" training schedules of the Americans and Japanese. It was quite common for the Aussies to sleep in! Their amateurism was apparent. Little wonder that the medal tally was one bronze! The six week steamer trip to Europe did little for their general condition; all gained weight and training was virtually impossible. Some were laid low with infections. Quirkily, they took a live mascot on board with them, a kangaroo "Aussie"! (who later grazed at the Athletes' Village!). Equipment was lost or delayed, the rowers trained in borrowed, unfamiliar vessels. Larry Writer set the political and general sporting scene, then by using (along with other references), athletes' diaries, family recollections and a series of interviews with Basil Dickinson, a long-lived Berlin athlete, produced a great, easy read. His follow-through of their lives and attitudes post-Games is of particular interest. “Once in awhile, right in the middle of an ordinary life, love gives us a fairy tale” – Unknown Author. Wedding and got one! The venue is quite beautiful and the gardens and House are perfect for a Wedding! The bride and groom looked amazing and stood in front of a rose arbour and an acoustic duo played throughout the Wedding. The live music I must say, added to the atmosphere. 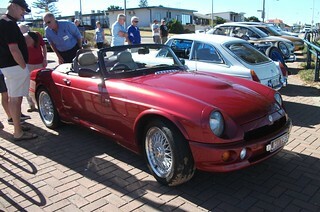 The MG 1968 Roadster was parked out the front and did Dietmar proud. It was surprising how much attention the car drew from guests at the Wedding and people in general staying there. The car was polished until an inch of it’s life and the wedding video will feature the car as the drone (camera) hovered above capturing every aspect of the wedding. The gardens photograph well from aerial shots and we are told this is the latest in wedding videos! For the ladies interested the gown, it was an Allure ivory tulle and guipure lace with a long train trimmed in guipure lace and diamante and satin buttons down the back the entire length of the train. Holly wore a small tiara and the veil was very long and featured Swarovski crystals around the scallops. The Wedding bouquet was large and made of Davis Austin roses in palest pink and cream with green hydrangeas underneath and looked dreamy. We are all now coming back to earth and I am hiding the credit card bills from Dietmar! Trust you have all had a Merry Mad March, doesn't our gorgeous city do rather well as host to the Fringe, Festival, Clipsal, Writers' Week, Womadelaide and Adelaide Cup? Balmy autumn nights, street markets, illuminated heritage buildings, funky precincts ( R.C.C. and Garden of U.D. ). what's not to like ?....oh, yeah, the road closures ... mmm. March is also a favoured time for weddings and WAGS co-editor Wendy Sauer is to be M.O.B of daughter, Holly (attendee of several runs ) soon. We wish Holly and Chad all the very best for their Big Day and their future together. Some "me-time" sure to come. "To watch that dodgy dial"
and you begin to snarl. It's up to you my darl"
and that's where you'll be basking! Throw a few fennel seeds on a prepared pizza, prior to popping in oven. Takes it to the next level! To Thermie or not to Thermie? Just from chatting with other Wags, I know several own Thermomixes and others are giving thought to a purchase, despite some recent bad press. Would love to hear from you on this topic. * could you live without it now? * factors you considered pre-purchase? * and are you saving time and money? Or have you purchased a rival product? Tell us all about it. If the price-tag is the concern; at what price would you consider buying one? Wishing all WAGS a wonderful Easter break and to those heading to Perth for the MG National Meeting, thank you for representing us and have a wonderful trip, a fun time and for those racing, Best of British luck! WELCOME TO THE WAGS' PAGE! New Year greetings to all! We look forward to another year presenting new profiles, editorials, recipes, pharmacy tips and travel stories for your enjoyment. We would like your feedback on the content and any suggestions with fresh ideas for inclusion. Please email Barb Harrington or Wendy Sauer! Judy’s story follows and please enjoy the good old days of rally driving. I was born and raised in Broken Hill, attended St Joseph’s Catholic School and studied Classical Ballet for 15 years from the age of 10 and qualified as a ballet teacher. I worked for medical and legal practitioners for 10 years prior to leaving Broken Hill. Broken Hill in the 1960’s was a very vibrant City, with lots of work for everyone. The population was around 30,000 and one knew most people, hence, it was a very sociable environment. I was introduced to motor sport through my Father and brother and where I met Geoff and became involved with the Barrier Sporting Car Club. The club activities were restricted to rallies, gymkhanas and social events. From time to time, I competed in rallies and have fond memories of those days and nights in the western districts of NSW, where the roads were always dry, rough, dusty and stony, with the occasional bottomless sandy creek beds and occasionally wet, boggy and sticky clay roads – all being good fun rally roads! The competition was very intense with crews coming from SA on many occasions. Being young and enthusiastic I started rallying, driving my Father’s Falcon and then Geoff’s Volkswagen and Datsun1600. I even drove my brother’s Ford Fairlane once, without his knowledge. Luckily for me it came home in one piece! During my ballet days my navigator friend and I had to pull out of the rally before we finished, as we were dancing in a Ballet Concert that evening. Two very white faces appeared on the stage that night, as we didn’t have time to apply our stage make-up! Another time, in the early hours of the morning, it was pitch black on a two wheeled dirt track somewhere between Menindee and Quandong when I thought I had a flat tyre. I stopped (in the middle of the track) and my navigator, Barb, and I both opened our doors, lent out and checked the tyres, however, unbeknown to us our timekeeper in the back seat got out and shut her door to “kick” the tyres. (That’s how her husband told her to check the tyres). After driving on for five minutes or so I said “how are we going for time Carl”? No answer! Again I yelled “Carlleen, how are we going for time”? Still no answer!! Barb and I both looked around into the back and guess what - No Carlleen! We stopped, did a u-turn and went racing back the way we had come. There, in the headlights in the distance, was Carlleen running up the road waving her arms! Well it was so funny, out there in the middle of nowhere, pitch black but it all ended well so we laughed our way around the rest of that rally. Once it was my job to take cars around and set them up on their checkpoints and when the time came to leave, I found that one car had not turned up, which meant I was down one checkpoint! So we set off as planned and on the second last checkpoint I left my friend, Carlleen, sitting on a 4 gallon jerry can with her pen, paper and clipboard, next to a bush on the side of the two wheeled track in the middle of nowhere with only rabbits, kangaroos and foxes for company, and I went on to set-up the next checkpoint. Imagine the surprise of the drivers as they came around a bend to find a female sitting on a drum ready to sign their time sheets in the early hours of the morning! Once, whilst on holidays in Adelaide and married, Geoff said we should have a look at a TF at Taylors of Medindie. Guess what, no TF’s but a MKII B on the showroom floor, red (of course) and I “fell in love”. When I sat in the car, Geoff said “it suits you”. Yes, we drove it home to Broken Hill and my father said, “nice car, but where are you going to put the bassinette”? “Parents”! Bassinettes were the last thing we were thinking of! Geoff and I really enjoyed our time in Broken Hill with the Barrier Sporting Car Club which celebrated 50 Years last year. In 1973 we decided to leave BH to reside in Adelaide. Some 10 years ago we acquired another MGB and became members of the MGCCSA, and we enjoy the club atmosphere and participating in events where possible. We are looking forward to going to Perth for the Nat Meet at Easter, as we had fantastic times at the Hobart and the Yarra Valley National Meetings. Best Western Melaleuca Motel and require registrations to confirm the numbers and recommend this be done early to avoid disappointment. We have 22 participants registered already and is shaping up to be a great touring event. The MG Club's nod to Christmas involves the Christmas Party on Fri Dec 18 and various Pageants where our cars are invited to parade. These are great community fun. Give them a go. In this issue we feature a look at European Christmas markets, a seasonal recipe for Austrian Crescents (all thanks to Wendy Sauer) and some health tips for the upcoming summer holidays. Grandchildren-minding-duties over the holiday period? * Avoid taking medication in front of children; they like mimicking adults. * Consider putting the Poison Centre phone number ( 131126 ) in the "Contacts list" in your mobile phone. The Poison Centre also deals with bites and stings, as well as poison/drug ingestion. * If you have medication in your handbag; keep in mind that little tackers treat open handbags as potential treasure troves. Keep well out of reach. It is best practice to keep all medication in its original child-proof container. * Broad spectrum cover, that is, it blocks both UVA and UVB. VERY IMPORTANT: Always apply sunscreen at least 20 minutes BEFORE sun exposure. If applied whilst already in sun; skin is unprotected. Don't forget areas such as ears, neck and tops of feet and lip balm sunscreen for lips. VERY IMPORTANT: Always re-apply after two hours in sun or immediately after swimming or excessive perspiration. Beat the butter with the castor sugar and lemon rind until creamy. Sift the flour and mix in, with the ground almonds and vanilla essence. Combine thoroughly to form a dough. Wrap in greaseproof paper and chill well. Form into rolls as thick as a thumb and cut into 2.5 cm (1inch) sections. Form these into 5 cm long rolls (2inch) long rolls and shape into crescents. Put on oven trays and bake in a slow oven until only just lightly coloured. Whilst still warm carefully coat in vanilla sugar or sifted icing sugar. You can smell when they are ready, delicious! The Christmas markets in Europe are held from mid November until Christmas. I was lucky enough to travel to Germany, Austria and Switzerland and visit the Christmas Markets using a rail pass. Perhaps one of the most memorable was Vienna’s beautiful squares that transform into magical Christmas markets. Imagine the aroma of Christmas bakery items and hot mulled wine as well as the smell of the chocolate shops! The most exciting was the cultural and Christmas market in front of Schonbrunn Palace – with such an imperial backdrop. The atmosphere of the market is traditional and families stroll around looking at the handicrafts, handmade decorations, Christmas concerts and Christmas workshops. The temperature was around 2 degrees, but dressed warmly the warm Vienna frankfurters and coffee were perfect additions to the evening. One of the most outstanding features is the family elements, everything handmade and not commercial at all with a very religious theme and good old fashioned Christmas cheer! We wish to take this opportunity to thank all those who have contributed both articles and ideas to WAGS in 2015. Signing off for this year and wishing you all a wonderful festive season! Please send submissions to Wendy and/or Barb marked "WAGS Submission"
Our Edition this month features a brilliant story from Wendy Turner. As you will read, not many of us will venture up into the isolated mid north of South Australia (almost Northern Territory) to be invited to visit the Aboriginal community of ‘Nyapari’. Along with the distance of travel and the story of meeting with the Aboriginal elders of the community would be a profound experience for us all and thank you Wendy for sharing your story with us. We hope to gain and understand more about ‘Nyapari‘ (pronounced Nap per ee) through your eyes! Wendy’s story begins: Life can be full of surprises! A little over a year ago our 34 year old son Mark happily announced to us that he had accepted a new job. Bryan and I were delighted as Mark’s usual occupation is ‘musician’ which is a very fickle industry to be in. We received further information about this new job. He had accepted a 12 month position as an ‘art studio manager’ in the very remote north western corner of our state, situated within the Anunga Pitjanttjara Yankunytatjara (APY) Lands. Mark, a city boy, who had very limited exposure to the Outback and to the world of art and Aboriginal culture, would be leaving his partner behind in Adelaide for a year! Nyapari is a very small isolated Aboriginal community of about 15 houses situated in the far north west of South Australia. The population varies, approximately 40 on average. It is situated 20 kms south of the NT/ SA border and about 200 kms east of the SA/WA border. The area is shadowed by the Mann Ranges and has some very nice scenery, and beautiful clear night skies good for star gazing. Well, one year down the track I am very happy to report that Mark flourished in this role and has just completed his 12 month contract. Bryan and I were eager to visit him and we decided it would be a once in a lifetime experience for us! So, we found ourselves recently travelling for 4 hours on a very dusty, isolated outback service track from Yalara, Northern Territory to Nyapari. By the way, this terrain certainly is not well suited to MG’s! We drove our Nissan X Trail and overall had a smooth run, apart from a broken windscreen, compliments of a road train, and a flat battery in Nyapari. We required a permit to enter the Lands for our 8 day stay. In many ways it was like going to a foreign country as English is not widely spoken. However, we usually managed to make ourselves understood. Mark’s house was very basic and one of the first houses built in the community. It resembled a few containers joined together and had very heavy mesh security on the windows and enclosing an outside verandah. I was amused to see the heavy lace curtains, they seemed very out of place! A certain amount of privacy is offered by the permanently red dust coated windows. The red dust gets into everything and is difficult to get rid of. The largest nearby community is Amata which is about 100 kms east of Nyapari. The town has a modern health centre, an art centre, and a church. The nearest store / service station is about a 15 minute drive west to Kanpi. The Kanpi store is open for a total of about 4 hours per day and closed on Sundays. It has a fairly good array of general stores, including fresh foods and reasonably priced. The Stevens Family settled the community back in the 80’s when the APY Lands were first recognised as a separate dedicated aboriginal area. The father of Keith Stevens, the current Chairman of the community, wished to have a community that was free of alcohol, marijuana, petrol sniffing and gambling. These wishes are displayed on a signpost as one enters the township in an effort to protect the children from these influences. The art studio originated back in the 1990’s and is a common addition to many of the Aboriginal communities (comes under the umbrella of Tjungu Palya Arts). The art studio is extremely important in the community. It acts as a social meeting place, provides a means of keeping the cultural stories ‘alive’ though art expression, and provides a sense of purpose and income for the community. It was a wonderful experience to see the artists as work. They took great delight in trying to explain and share their story with us. The majority were older people, often with grand children/ great grandchildren present. We had some wonderful experiences during our stay and the local community went out of their way to share their culture with us. One evening Keith guided us to 4 sacred sites that he wanted to share with us. There was a convoy of about 20 of us, including his family in 4 vehicles. Keith used body paints and there was accompanying dancing, singing and the tapping sticks serving as music. There were some amusing moments, especially in trying to get a fire started as no one had brought any matches and fire was an important part of the story. We were also taken witchetty grub collecting and experienced a very successful time with our digging sticks and shovels! The grubs are found deep within the witchetty tree roots. This ‘delicacy’ is usually quickly cooked in coals, although, some are eaten raw (not by us!) They can be quite large – see accompanying photo! They really were quite acceptable on the palate, a bit of a nutty flavour, certainly much more palatable than the kangaroo tail we had a few days later! A real highlight for me was sitting with the women and being taught to basket weave, or Tjanpi, as thy refer to it. Wipana, my ‘teacher’ would occasionally break into song and I wanted to bottle that moment in time! The ‘Tjanpi Desert Weavers’ was established in 1995 and has become a small financial enterprise for the women. ( More information at www.tjanpi desert weavers for anyone interested.) The women’s work is collected every few weeks and new materials brought out to them. Unlike the artwork there is a cost to purchase the rafia type string. Mark had told us that the wild brumbies frequently come into community! Right on cue they arrived on our first night! These amazing animals have mastered the art of turning on the backyard taps with their mouths. We had about 6 brumbies in our yard that night. Quite a sight. I could write so much more to tell you more about our wonderful experience in visiting Nyapari. It was such a privilege to visit the community and to gain insight into a different way of life. We both must also admit to feeling very proud at how well Mark was accepted by the community and what he achieved in the 12 months he was there. He has had experiences that will shape his life forever. And more surprises……. should you happen to be interested in relaxing music Mark has released some music on I Tunes. Just google Mark J Turner “Wanderlust”! He recorded this in his spare time while he was in Nyapari. His time was also productive in other ways - we are to be grandparents in the New Year! Thank you for reading our news and look forwards to seeing you on a car run in the future! This month we have been lucky enough to receive a WAGS’ profile from Sue Gilson. Her story starts with her life in Yorkshire and then subsequent immigration to Australia. It portrays a very talented lady along with Bill her Architect husband and their journey to Australia. We embrace these stories of adventure and seeking a new life in a new country with their children. The important fact is that buying an MG brought them to us to meet and enjoy their company! Enjoy readying this story as much as we did upon receiving it! My name is Sue and I’m a chocoholic...Oops, sorry, wrong article! My name is Sue and I have half of a beautiful dark blue MGB V8. The other half is owned by Bill Gilson – that’s the half that needs all the attention! We don’t seem to get to many of the club activities despite our best intentions. We enjoy the big runs, Kimber, All British Day, McLaren Vintage and we try and join in with the breakfast runs where we can and when we do, we thoroughly enjoy ourselves and wonder why we don’t do it more often! I have worked as a physio with children for over 30 years. I get to massage babies, sing songs, play with children, help them to develop their physical skills, climb on the trampoline with them to help them jump, teach them to ride a bike, be in awe of the most amazing families I meet and how they cope with their heart wrenching struggles and cry with them when their child finally masters a skill that we all take for granted. I reckon I have the better job! Some of you may have noticed that Bill and I have a slight accent. We hail from Yorkshire, God’s own country where you call a spade a shovel and the remedy for most ills is a cup of tea and a brisk walk in the fresh air! Bill and I were childhood sweethearts, we were only going out with each other during the summer holidays before Bill went off to University - 40 years later and we’re still together – how’s that for stamina! I went off to study physiotherapy in Liverpool. At the time I was young and foolish and seriously hoped I would meet Kevin Keegan (very famous footballer of that era!). Sadly that didn’t happen, maybe we didn’t live in the same neighbourhood? Bill and I eventually ended up in Manchester and I don’t think my dad ever forgave me for having our children born in Lancashire rather than Yorkshire – Dad was still under the impression that you had to be born in Yorkshire in order to play Cricket for Yorkshire. Needless to say, our son was never even interested in cricket! Bill and I enjoyed exploring Europe. I didn’t appreciate the variety of cultures, architecture and landscapes of Europe until I emigrated and I’m still appreciating just how big Australia is. We have always had an interest in cars, and had an X19, Opel Manta GTE, SAAB Turbo to name a few of the good ones. We also had a Hillman Imp – or Hillman Limp and a Vauxhall Chevette or Vauxhall Shove-it – these were not good buys! But cars were not our only form of transport. I spent many a happy Sunday on the back of a tandem with Bill and our 2 children also tagged on behind me. Yes, a tandem built for 4! We belonged the North West Tandem Club and spent many a good weekend with other like minded families exploring the English countryside and we almost caused several accidents whilst cycling on our extended tandem in Holland. We had a trip to Australia 30 years ago to visit Bill’s relatives. He had a few rellies over here that were the Ten Pound Poms, including his grandparents who retired here. We fell in love with the place. In fact, I cried all the way to Singapore on the way home! We really wanted to emigrate then but ‘life’ had other ideas so we plodded and cycled on in Old Blighty. Bill was a partner in a firm of Architects that designed and built football (soccer) stadiums and worked on Wembley Stadium, Liverpool, Manchester United, Wigan and Blackburn stadiums to name but a few. Then Bill had a Mid-Life Crisis (first of many but they are other stories!) We figured we were at a stage when we could apply to emigrate. Let me tell you that process isn’t for the faint hearted! It took us 3 months to fill in all the forms and gather the information – which primary schools we went to, parents and grandparents details, not only the list of jobs we’d had but actual proof we had worked where we said we had, any criminal convictions – including traffic offences. They just stopped short of asking for Bill’s inside leg measurement! We were completely surprised when we were accepted, it was a case of “oh heck, what do we do now? !” So we sold up, gave up 2 good jobs, took 2 children out of school and came to the other side of the world with no jobs to go to. Thankfully we did have wonderful family who took us under their wings, the children met cousins they had never seen before but soon struck up friendships with them. I can’t say that I would do it all again in a heartbeat but we had blind faith that it was the right thing for us and it has ‘Turned out grand’ as we say in Yorkshire! After all, we’ve got to know your good selves! 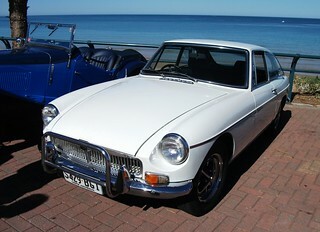 Bills second mid life crisis came on our 25th wedding anniversary, when we hired an MG for our celebratory weekend away. This was the start of our life with an MG, When we got home Bill said, “There is no reason we shouldn’t own an MG.” After looking at many cars bill found the blue B that needed a great deal of work, I just didn’t believe he was serious when he took me to see it. There was the car body and 32 boxes of bits spread around the garage – not the most endearing sight! The hard work was worth it though, there’s no better feeling than being out with the lid down on a sunny day in a line of other MGs on the country roads! The PS is – we’ve both had jobs for the last 18 years, survived the teenage years with our children and seen them settled with jobs, visited some fabulous places in Australia and had a fantastic time as Tour Guides for our UK visitors, Gilson’s Guided Tours!) so life has been good! See you on a run! We will be waiting for them! In this issue Robyn Wakelan tells of her visit to the Morgan Car Factory in the U.K. on a recent trip there . This is no ordinary assembly-line manufacturing process, this is indeed artisans at work, as she explains. Also Wendy Sauer has prepared a lovely Parisian walk suggestion for us. When Jerry and I toured England in May 2014 we took the opportunity of touring the Morgan Factory, located in Malvern, Worcestershire. The visit was planned with not much enthusiasm from my part I must admit. I went with an open mind that I would see something that I had never seen before, so there was a good chance that I would learn something. However, Jerry’s anticipation of the visit was something quite different. He would be visiting the birthplace of the car that he had always wanted to own, or if not own, at least get a chance to drive. He did not drive a Morgan until later in the year when he was test driving one he was looking at purchasing. What he found was that it was not as enjoyable to drive as his MGB that he ended up buying. What an eye opener the tour was, especially for me. I found it fascinating the amount of detail, the care and obvious love of the car that each craftsman put into his work. The cars were hand crafted, panels hand done, the upholstery for one car all cut from one piece of leather and not a stamping machine or conveyer belt to be seen anywhere in the factory. Rolled edges of wheel arches were rolled and hammered by hand with such precision and speed it was astounding. Depending on the location and the job that the employee was doing, we were allowed to speak with the employees and ask questions. Most of them were so absorbed in their work that the tour participants didn’t seem to exist. The employees stayed with the company for many years and started as apprentices and continued as, what I would call, master craftsmen, staying within their section. I truly enjoyed the visit, as did Jerry, and we marvelled at the workers’ skills with huge respect at their handiwork. If you ever get the chance, I recommend the tour. There are eight guided walks to enjoy around Paris. Paris is a city for walking and is more compact and easier to get around than many other great capitals. Most of sights are within walking distance of one another and close to the heart of the city - the Ile de la Cite. One of my favourite walks is the 90 minute walk in Buttes-Chaumont. This area is east of the city and is little known to many visitors. It contains one of Paris’s biggest and most beautiful parks and some incredible architecture. The walk is quite strenuous with many steps and takes in a charming micro-village, the Butte Bergeyre, which is high above the city and has unusual houses in many styles. After descending from the village, the walk continues in Buttes- Chaumont Park, a vast hill complete with a lake and a huge island and folly, rocky outcrops and wonderful variety of trees and plants. The Buttes-Chaumont Park was commissioned by Napoleon III and Baron Haussman in 1864 and covers 61 acres – yes in the heart of Paris! It took 4 years to complete and contains mature trees like planes, poplars, ash, maples chestnuts and magnolias. In the park there Is a high waterfall and hidden inside a grotto. It finishes at the metro stop of Botzaris where you can metro back to where you are staying in Paris. Guess by now you have read the account of several Wags' experience, travelling to the recent National Meet in the Yarra Valley. Many of us were "newbies", having only Adelaide hinterland runs under our belts. So ladies...now it's your turn. We'd love to hear your experiences on your MG times away...weekenders, interstaters etc..
* Did you feel a sense of adventure? * Was your car a conversation starter? * Were you declared a Sat Nag? * Did you harbour a secret desire to substitute the spare tyre with a few more pairs of shoes? * Were you stoic and uncomplaining when the imperfect sealing of the "lid" became apparent during a deluge? * Any tips for those considering such a tour? Adelaide to Host 2017 National Easter Meet! A couple of preliminary meetings have already been held regarding this Event. It's always exciting and challenging to "have a go " at doing something new, adding a bit of zest to life, firing up neurons... maybe even slipping into discomfort zones! Here is Jeanette's sailing story: "Jeanette's Boating Adventure"
This is not your normal story about a trip in an MG, or an overseas adventure, but something rather different and much closer to home. I was invited aboard Don Walker's yacht, 'Marietta's Song', for a trip up the Murray from Goolwa to Clayton Bay, and beyond, for a boating picnic with the Wooden Boat Association. Sounds pretty normal except I have never been on a yacht and Don had only just taken up sailing! Luckily the weather was on my side, no wind and raining on and off(? ), lucky for me that is, no 'sailing' and travelling under motor only. After learning my 'cast-off'' duties we left our mooring on Hindmarsh Island and were soon under way to our first stop, the Armfield Slip at Goolwa, and to meet up with Lotus, a restored 1910 River Boat, along with a mixed passenger list. Don is a member of the Slip and says it's a place that keeps 50 year old men off the streets, in fact it still restores and builds wooden boats using the original boat-building techniques. Next stop was to meet up with a 1930 Ketch and a vintage yacht on the other side of the bridge. The yacht had an all female crew and looked the part. The 3 hour trip was fairly uneventful, me learning about the channel markers, where to sail, and the basics of sailing. Meanwhile Lotus got quite a bit ahead as we slowed to let the older yacht catch up. We soon reached Lotus and passed her only to realise about 300 metres further ahead, and after having turned around, that something was amiss with her. She had broken down. The Ketch also returned and quickly had her under tow for the last few K's to Clayton Bay. Safely docked and Lotus repaired we enjoyed our picnic and a secret bottle of red I had smuggled aboard. Three and a half hours back to our mooring with me in control for a part while Don was below making a 'cuppa'..... and in the drizzling rain we realised we had the whole river to ourselves. Just after passing the bridge and Goolwa Wharf we circled and watched Steam Ranger leaving the station, what an historic nostalgic moment. This was my first and hopefully not my last experience on a boat and what an exhilarating feeling it was. And I didn't have to organise a thing! 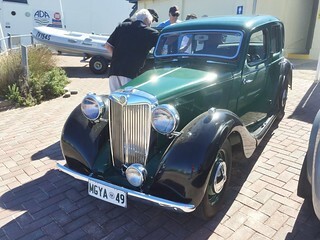 3 MG’s from the SA club drove to Wallaroo to participate in the Copper coast Classic Cavalcade of Cars on Sunday 24th May 2015. Participants were Wendy and Bryan Turner, Barbara Harrington and Steve Spong and Wendy and Dietmar Sauer. The car run is open to vehicles built 1985 or earlier. This includes motor cycles, trucks and retro caravans. The Copper Coast 21st Cornish Festival attracts approx 35,000 visitors with 60 events and activities staged in Kadina, Moonta and Wallaroo. This festival is a celebration of the region’s significant Cornish heritage. On Saturday 23rd of May we attended the Kadina Rotary village Fair. A very traditional event including Maypole dancing – 7 maypoles and the local school children participated and a credit to their skill in weaving the maypoles. The community event was enjoyable with the locals playing music, singing and of course the Cornish pasties were large and very tasty! Back to the car run on Sunday. This meet is held biannually and commences with a breakfast cooked by the Wallaroo Rotary Club and then an extensive cruise though Wallaroo, Moonta, Pt Hughes and Kadina finishing on Kadina Oval for a Show and Shine and Rock and Roll programme. The Classic Cavalcade attracts over 500 vehicles with awards in a number of categories. The range of vehicles was varied and farmers from surrounding districts had literally taken covers off vintage cars stored in their sheds and driven them to the run to participate. Some vehicles in spectacular condition over 100 years old. There were another 4 MGs that had been driven from the Riverland. This run gives enjoyment to thousands of spectators that line the route as the cavalcade progresses. This represents another great car event that is on offer to us in South Australia with a wonderful community spirit! To view photos of the weekend click here. These are a really tasty and easy little snack to make…… ideal for that morning tea when you are out MG motoring ! Then mix all ingredients – Thermomix 30 – 40 seconds/ speed OR can be made in other blenders but time and speed will vary according to machine. You can substitute the nuts, add other dried fruits, chia seeds, cinnamon, cardamon etc. Keep in an airtight container. Robyn James has sent in a photo of the MG and report on their wedding. “Jerry and I were married two days after Christmas. I really don't know what we were thinking for the timing, except that my youngest son and his family would be here for Christmas from Queensland and my brother and his wife from Victoria. We had a beautiful day filled with family, friends, lots of music, dancing, a High Tea and later dinner. Soccer plays a big part in Jerry's life so naturally it played a bit part in the wedding. We had a soccer match as part of our festivities. If you are going to the UK be sure to make a booking on the Eurostar which is the best method of crossing the English Channel connecting England with France and the rest of Europe. Direct rail service from London can take you to Paris and Brussels and will soon be extended through to Germany in the years to come.Tunneling began in 1988, and the 50.5-kilometre tunnel was officially opened by Queen Elizabeth II in Calais on 6 May 1994. The tunnel is 31 mile long and runs underneath the English Channel. More than 17 million tons of earth were moved to build the two rail tunnels. 3 different types of trains utilise the Eurotunnel. Eurotunnel’s own trains convey cars, trucks and buses between the terminals Folkestone and Calais. Each train can carry 766 passengers and reach a speed of 186 mph. A Eurostar Train was named “The Da Vinci Code” and carried the entire cast from London’s Waterloo station to Cannes Film Festival in France for the global premier of “The Da Vinci Code” film in 2006! A bit of trivia for you! Please tell us all about YOUR weekend (or longer) getaways in your MG. All submissions appreciated! The following attendees Bev Waters, Jan Dinan, Judy Glasson, Kathy Maxwell, Sue Holmes, Michelle Edwards, Chris Bray, Ann Moulds, Wendy Turner, Barbara Harrington and Wendy Sauer all drove to the meet and we had a brilliant time! Bev Waters, Life member of MG SA Club did us proud winning a trophy. Bev as you accepted the award we would like to say how proud we were of your achievements and also service to the MG SA Club over many years! report the cars purred along beautifully travelling in excess of 2,700 kms. The only incidents being a flat tyre on Steve Spong’s car and a broken exhaust for Bryan Turner which were easily repaired. The Yarra Valley National Meeting was incredibly well organised and their motto was a “Fun and Friendly” meet which rang true throughout. Friday night’s welcoming Noggin and Natter was fun, and featured Rockercover Racing which we girls are still trying to work out what they represented! Ian Curwen-Walker, our MG SA Club Life Member and “Guru” proudly carried the MG SA Club banner to commence “The Games”. What a great choice to represent us. The new MG Melbourne Clubrooms had been finished almost the day before and featured MG motif carpet specially made and a ceiling made up of octagonal shapes representing the MG Emblem. Well done guys! The finer points were noted. Saturday was the Concourse and Saturday night a social Barbecue. Sunday Speed Event – Hillclimb and also the Observation Run which combined navigation and observation test enroute to Kinglake and after lunch a 30 minute non competitive tour to Rob Roy Hillclimb. Monday was the Motorkhana at Bayswater North. On Monday there was also the Kimber Run travelling to Marysville – the fire ravaged countryside which has all re forested and is a credit to the community with the rebuilding of the infrastructure. The Autumn leaves were a delight. The Kimber Run was a great drive with many twists and turns which gave us a challenging day’s driving. The run followed the Yarra River up to Upper Yarra Dam, through amazing mountain and alpine ash forests. Monday night was the presentation Dinner at Ringwood. Venue great as was the food! Mike Greenwood looked very dapper in his suit! We were well represented and congratulations to our SA Participants who won awards. View the many others photos from the Nationals. We all had a great experience sharing stories about the day’s activities, drives and MG’s travelling tales. We look forward to the Meet in Perth 2016 and then Bev Waters is working on the 2017 meet in SOUTH AUSTRALIA!! Any suggestions for our 2017 would be greatly appreciated so that we can mirror the success of the Melbourne MG Nat Meet – we know we can do it! I am currently the Regalia Officer for the Club as well as the Librarian. Many members know my past activities in our Club, but for the benefit of our newer members, here is a brief summary. I (together with Wayne, my husband) joined the MG Car Club of SA in 2006, when we purchased our first MG, a 1960 MGA from Bazz. I served as the Club Treasurer for nearly 4 years when Wayne was President, and I was responsible for setting up the Club’s financial management system. I have also installed a Library cataloguing system for the Club. In 2012, I designed and programmed the current website for our Club when Wayne was the Web Editor. This was mainly because of my background as a computer scientist, so here goes for my history outside the Car Club. I came to Adelaide in 1959 with my parents (yes – I was a 10 Pound Pom!) and went through most of my schooling here, including receiving an Honours Science Degree in Mathematical Physics from Adelaide University in 1969. I went to work at DSTO, Salisbury as a scientist having been a Cadet Defence Scientist, specialising in computing science, where I met and married Wayne in 1972. I worked there for nearly 30 years, involved in mathematical modelling of aircraft and missile defence systems and then on to the administrative management system used in the Administration of the Salisbury site. I have seen computers evolve from machines the size of the Clubrooms to an equally powerful device that now goes in my handbag. Amongst my other interests has always been sewing; I make a lot of my own clothes, especially vintage fashion to wear to the Goodwood Revival in the UK. I make all my own curtains and cushions and I even made the 2000 Millennium embroidered quilt- that was before the MG Car Club years! I have a number of sewing machines, including a Pfaff embroidery machine and a very old, but still very efficient, Pfaff industrial sewing machine. When it came to restoring our first MG, I was able to use my electronics training to do all the wiring. As well as that, some years prior, I had decided that I wanted a new lounge suite. Our old one was well built and we didn’t want to part with it – so I went to the Marleston TAFE to learn upholstery and turn the chairs into the colour I wanted! Since 2006, this skill, together with the aforementioned industrial sewing machine, has proved invaluable in MG restoration. When we finished the MGA, we thought we would like a TC so we acquired a 1947 MGTC, again from Bazz, but it didn’t need much restoration work apart from the hood. Then winter came and we wanted a GT to keep the rain off – MG A’s and TC’s are not the most water resistant cars, so again we visited the original MG Sales and Service and bought a 1960 MGC GT for total restoration. Again, upholstery and electrics were my responsibility. Somewhere along the line, we bought a very nice 1965 Mk 2 Jaguar, that is still being restored but may well be on the road next year. I have no human children, but my present family includes 2 beautiful Australian Cattle Dogs, called Jack and Jill. They are well known amongst the Vintage Collingrove set as they accompany me in the tow car and on the ladies’ touring activities, just like 2 legged children but much more easily pleased. I am sure they will be very happy once the Jaguar is back on the road as it has 4 leather seats and plenty of room and there is nothing better than having a ‘cat’ do the work for you! Since 2009, both Wayne and I have competed in motorsport with the Club, in a modern MGF (better brakes!) but we have now reduced that to only hill-climbs and motorkhanas, as the sprints got a bit too exciting! We are both mad Formula 1 fans and I had to rush out to get Foxtel to watch this year’s races when they acquired the rights over Channel Ten. Every race weekend, there is a ritual in our house; we tape the qualifying and the race if it is late at night here, then in the morning there is a “media blackout” so we don’t accidentally hear the result. Then we all (Jack and Jill included) take our seats to watch the replay. The “fur kids” know that on GP weekends (identified by the sound of F1 cars coming from the TV) walks are not undertaken till after the racing! One of my other interests is gardening and gardens; I have been a Guide in the Botanic Gardens of Adelaide since I left the Defence Department in 1995. My own garden varies according to the season and the amount of spare time available, but I have some lovely old heritage hybrid tea red rose bushes, from a nursery that closed down in Gawler in 1972, as well as a couple of old eucalypts (planted some 30 years ago) and a whole lot of other plants in a lovely jungle of green. Periodically, I have a go at vegetable growing and this year have had a lovely crop of cucumbers, spinach and runner beans. I always seem to have trouble with tomatoes, but one plant grew well and produced some nice edible fruit, so I am encouraged to try again next year. Wayne has been heard to say that the tomatoes produced cost 10 times more than if I had bought them at the supermarket. We have a “Bucket List” of things to do before it is too late, so there is never a shortage of planning ideas in our house for the next big activity. When we go on holidays, we try to visit one of the world famous Grand Prix tracks to see what they are like in real life. My favourite so far has been the Belgian track at Spa Francorchamps. It is superbly situated in the Ardennes Mountains and the track can be seen snaking up the hill from Eau Rouge (the Mythic Corner) to the top of the mountain deep in the Forest, before reappearing to race down the other side to the Bus Stop and the Pit Lane area. I am also a member of the Sporting Car Club of South Australia and of the Goodwood Road Racing Club in the UK – the Club responsible for the Goodwood Revival and Festival of Speed. I wanted to join the GRRC because, as a Member, I have access to much more comfortable relaxing areas and clean facilities with no queues – a view shared by at least one other lady Member! Some of you may remember my stories about the Revival and our clubhouse, known as the Kennels. The building is in Georgian style, built by one of the Dukes of Richmond and Gordon to house his hunting hounds. The kennels were heated and air conditioned before the main house. It is fabulous to sit with a nice glass of bubbly or a cup of tea and look out towards Goodwood House after a hard day at the Motor Circuit. The time that I have been a Member of the MG Car Club of South Australia has been rewarding, challenging and happy and I would urge all the other WAGs to get involved as much as you are able, there is always something for everyone to enjoy, even if you are not a “petrol-head”. As New York City has proven to be a very popular travel destination recently amongst MG Wags, and more are planning the Big Apple adventure, we thought it may be timely to focus on some travel tips and a book review about this bustling, edgy metropolis. Oh, and if you are planning on seeing a few MGs there, good luck, we didn't spot any in our seven days! (Send your other half off to USS Intrepid, see below). * Get a Subway weekly ticket if you plan on being there for a few days as they are cheaper and more convenient. Keep in mind that train stops labelled express will take you quickly to stations a distance away, maybe not where you planned! If adventurous get off and take a look around and catch next train back, if not, take the trains signed as local, which stops at every station. * There are not many, if any, public toilets in NYC, so keep in mind that Macy's and McDonald's are available. * Staten Island ferry at dusk is lovely, great views looking back over Manhatten skyline and it's free. * Art Deco hit is an organised tour of Waldorf Astoria Hotel that includes either lunch or dinner. * Definitely walk the Highline in Chelsea - start mid city that takes you straight to lower Chelsea and West Village. It's an old elevated rail track that has been turned into a linear park, when completed, have a break and then explore the Chelsea Markets. * Empire State Building - get there early, say 15mins before opening time and you will save yourself a lot of waiting in queues, also do not accept offers from hawkers outside on footpath. * Get ferry to Hoboken (get off 2nd stop). This is Frank Sinatra's birthplace - nice eating places and gorgeous architecture, return trip on ferry a good photo opportunity! * For the boys, USS Intrepid is well worth a trip, there again try to do early in day to avoid crowds. * Walk the Brooklyn Bridge. BUT catch the subway to Brooklyn and then walk back across the bridge towards NYC, much better! * Try "Eataly" for something different, especially for a foodie. They have decent coffee and lots of different cuisines to select from. * Le Pain Quotidien does a good coffee, it is a chain but a bit more polished and consistent and they have healthy options food wise. When ordering coffee ask for a pot for one with 2 cups as there is enough for one and half cups each. * Take the time to talk to the locals, the shop assistants and the waiting staff, they are so friendly and only too willing to talk politics etc, very interesting what you find out that isn't in the newspapers!! * Tipping - remember this is part of their economy and culture. As a guide it ranges from 15 to 20% (average to very good service) of the bill. Always check as sometimes it is added already! There is so much to do and see. These are just a few hints and suggestions. ENJOY! BOOK REVIEW: "New York" by Edward Rutherfurd. If NYC is figuring as a likely destination in your holiday plans, this is a great read. Edward Rutherfurd has written inter-generational well-researched novels on this and other cities, (e.g. Paris). You will subliminally absorb a potted history and geography of the city, as the easy-reading tales sweep you through the generations. Don't be put off by the size of the tome, however, be advised to start reading well ahead of your trip! "New York" begins with the Dutch settlement in the 1600's and tracks several families through the War of Independence, the various waves of migration, the Gilded Age, the World Wars, and ends with 9/11 and much in between. It was wonderful to visit NYC, especially after having read this book. I had a much deeper understanding of its intriguing, complex history and a greater appreciation of its significant geographical sites. The book is available through the S.A. Library system. Perhaps you can add some tips or share your experiences of New York? WELCOME TO THE MG WAGS' PAGE! Hope you enjoy our monthly editorials and look forwards to your feedback and future contributions! For our WAGS profile for this edition we are thrilled to write about Gloria George and as you will read below has quite a story to tell. I grew up in Woodville Gardens and attended Challa Gardens Primary School. I undertook my secondary education at Woodville High School. When I left school, my first job was as a typist in the production control office at General Motors Holden (GMH) at Woodville. I auditioned for the position as lead singer with the successful Starlight band. As a permanent member of the group – which featured keys, guitar, drums and saxophone - we played in many city hotels. While I was performing with Starlight I also gained a position with Wonderland Ballroom, where as part of a large orchestra we performed dance band music for a weekly radio broadcast for Radio 5DN. A few weeks after I joined the Starlight band, I went on a first date to the Glenelg Coffee Lounge with the band leader. (That was Leyland!) In 1961 we became engaged and we were married in 1963. We continued to perform and I was employed with GMH until 1967, when I retired from the typing pool to start a family. I even got long service leave after being employed for 13 years. We had a daughter first, Anne, who was born in 1968 and a son Stuart, two years later. Soon after I joined in with Leyland’s interest in cars and motorsport, participating with him in many rallies and club Motor Sport events. We have been members of the Sporting Car Club, the Alfa Romeo Owners Club and now the MGC Club. I was an entrant in the 1979 Mrs South Australia Quest – and won the runner up award! I discovered a love of art and joined the Brigalow Art Group in 1990, learning skills in painting with oils, pencil drawing and charcoal. I was successful in selling a favourite piece at the Victor Harbor Art Show for $295 - a big surprise! My creative interests also include quilting and sewing and I belong to a quilting group where we are set regular creative challenges. I have an extensive collection of china frogs and also love to collect newspaper clippings, which I often send to my grandchildren. 2013 – special 50th Wedding Anniversary trip to Singapore, with dinner at Raffles, which was very enjoyable. I have been involved in several car restorations, including rebuilding an Alfa Romeo. During our time with Alfas I also participated in Driver Training Programs and Sprinting. It was in early 1990 whilst restoring an MGB that we joined the MGCC. My assistance with this project was pushing and shoving and doing tiny tasks until it was complete. I realised during this car project, one of many, that I am not very big but I can lift heavy things! We continue to enjoy the club and the car and continue to have many adventures in our busy life. We have a recipe sent by Victoria Gore. She thought this would be good to prepare the night before a breakfast run and have as a healthy alternative to bacon and eggs ! It also saves taking all the cooking gear for a change. The recipe is for one but the idea is to multiply and put it into mason jars which seem to be trendy at the moment. In a bowl combine yoghurt, oats, chia seeds, and milk. Stir to combine then layer half in a wide-mouth mason jar or container. Add half the fruit and berries then layer on remaining yogurt mixture and berries. Refrigerate overnight, and up to 3 days. Enjoy cold. Our travel tip is from Wendy Sauer. If you are contemplating travelling over for the Goodwood Revival meet in the UK in September you had better book accommodation pronto! We have sources reporting that accommodation at Southampton is selling out and that is over one hour away. If you are flying to London be sure to book on the A380 aircraft. This means the “double decker” super size aircraft. It carries 516 passengers which is the capacity of a Boeing 777-200 and an Airbus A340 put together. The take off is brilliant with a virtual experience from your seat watching the aircraft take off and land as a camera is mounted on the rear of the aircraft. A big thank you to our early contributors, and also to Holly Sauer for designing our header. So, while HE has his head under the bonnet; what are YOU up to? ...perhaps you have an interesting volunteering position or an absorbing hobby, tell us all about it! Volunteers abound in our ranks. We have for example, op-shop, detention centre, library and school workers and tour guides. One of our number accompanies overseas cranio-facial patients, whilst in Adelaide. Of course, there are the female motor-sports' volunteers too. Just talking around at MG runs; one hears of everything from the gentler arts of, for example, mosaic craft, restoration of rocking horses, quilting, language learning, travel and music; to the adrenaline-pumping exploits of car racing and air sports. So, c'mon girls we'd love to hear from you. In this issue Shelley Bazzica describes her "life as an adventurous person" and Cathy Maxwell, who has been involved in car restoration, shares with us a mean macho meat marinade "aimed at the blokes " for the summer BBQ season. The story of my life as an adventurous person starts early, firstly by marrying Bob Bazzica. Just after marrying, my husband presented me with a runabout car; a rather large Jaguar Mk7 manual overdrive saloon. I drove it home, could just see over the dash, and immediately took out the letterbox as I entered the driveway. This was then followed by a Humber Super Snipe Mk4, then a Prince Skyline GT with triple Weber carburettors. I certainly drove some unusual cars! Later, Bazz gave me an MGBLE which was a show car, this lasted for a while, then Bazz decided I should start racing, it never occurred to me to say no! The first race track on which I drove, was Simmons Plains in Tasmania. Bazz organised a private practice lap, and under his guidance I immediately left the track in a huge spin right in front of the timing box; he was under the dash screaming brake, brake! The officials were not impressed. Next was Mt Cotton Hillclimb in Queensland, followed by Mallala racetrack, then Newcastle Hillclimb and of course Collingrove Hillclimb. I enjoyed Collingrove; one exciting time was when I did a big spin amongst the white painted rocks at the top (bit of exhaust work, but no bodywork was needed). Soon after this my dear husband decided to put a V8 motor in my LE. After a few laps around Mallala I found the car to be too quick for me and so I retired from Motorsport. This was when we found a new interest: AIR SPORTS. Bazz was always interested in flying. We looked at gliding etc. but finally decided to look at ultralights, going to Strathalbyn Airport we found powered Hanggliders. On the first fly day, Bazz of course sent me up first to try it out. His excuse was if I did not like it, it was a waste of time doing it. Well I enjoyed it, so we started training, bought an air craft (an "English Pegasus"). We owned it for 13 years, had a lot of fun; I even had an "engine out" landing which turned out OK. Finally the thought of getting out of bed at 5.00 am became unattractive to me, so this phase passed. In between all this I have ridden motorbikes at a friend's block in the North, and when this was sold I have now become a conventional Shack owner & Housewife. Mix all together and pour over steak, lamb, or whatever you are going to BBQ. Toss around, cover with plastic wrap and leave in the fridge to marinate for at least 2 hours or even better overnight. Makes the meat tender and gives it a subtle flavour. Welcome to the first contributors who have been brave enough to send in some material. We would like to extend an invitation to all our female readers to email submissions for the 2015 Magazine and the web site. Thanks for your very timely advice.. ..
I’m dreaming of a White Christmas and when all the white has gone, I’ll start on the red!! Sue also sent in a great recipe which we will save for the magazine. Advice from the "Cancer Council" : Slop on broad spectrum, water resistant SPF30+ (or higher) sunscreen. Put it on 20 minutes before you go outdoors and every two hours afterwards. Sunscreen should never be used to extend the time you spend in the sun. For lots of handy savings hints for the household, check out an interesting Website :	www.simplesavings.com.au ( where there is free access to their Newsletter Archives). When travelling in Europe – go to the main railway stations. That’s where you will find the best local food, cafes, shops and more importantly toilets! Always have coins for entry into the toilets. In Italy they give you the toilet paper as you enter!! .....and from Robyn James: A saying that Jerry and I live by is: "When you stop playing, you're dead." This is open to all our female readers who have something to offer to our web site and magazine. We plan to feature a female MGCCSA Member with an editorial about their life and times. Tips on pharmacy, travel, recipes, film and book reviews and everything. In general. No submission is too small. The contributions will be eclectic information that our female readers may appreciate. A good mate of mine ‘Safety Fast Pete’ (Now Editor of The Australian T Series Assoc.) was told by John Thornley when he visited the MG Car Company many years ago-“You know Safety Fast Pete, you can go anywhere in the World on those two letters:- M & G.” And how right John Thornley was! Several months ago our MGC Register bloke, Ian Hobbs, sent an email to all of our members who own these lovely old machines here in SA and in this email was an attachment from the MGC Register of New Zealand which really interested me. 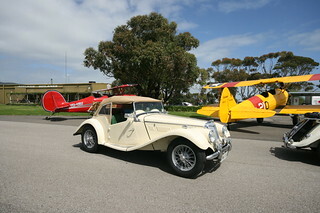 Ian had been corresponding with two Club members of The MG Car Club ( Auckland Centre) Inc, exchanging information regarding the MGC’s on the South Australian Register and they reciprocated with a very detailed computer schedule regarding MGC’s which were known to exist in New Zealand. These two gentlemen are: Peter Dunlop MBE and Ian Grant; Peter is the Register Secretary and Ian is the Register Historian the Register also their Club has a Historian, Harvey Heath. The numbers of MGC’s imported into Australia were very small, most having been imported into the USA where some 76% were sent between 1967 and 1969 and there only 163 RHD MGC’s exported during this time some of which were imported into New Zealand. It has been Ian’s task to find them all with encouragement from Peter. Teamwork! The reason that there were no MGC’s available here to Australia in 1968/9 was due to the fact that Australia was aligning with the USA regarding the changes in safety features and the MGC had a non-acceptable dash; if we wanted to receive these with the American padded dash this would have meant a modification which the MG Car Company was not prepared to change. Not to mention that they look dreadful and dispensed with a glove-box altogether! I digress! The reason that I became interested was because Jan & I had booked to go on a cruise on Dawn Princess to New Zealand back in July and I had noticed this report so I emailed them both with instant replies from them both, this started to process and the invitation to meet when we got to Auckland. So a series of exchanged emails followed and we were overwhelmed to read that both Peter & Ian and their wives; Reawyn & Joanna were going to meet us at the wharf when the ship docked with a small bus and take us around Auckland in the bus, very special treatment! Fortunately our MGC neighbors over the ditch had been pre-warned about the impending arrivals by our Mr Hobbs who had also contacted them and had caught up with them the several weeks before (separate report)plus I had send them a couple of photo’s of Jan & I so they knew who to look out for when we got through customs and out into the fresh air of Auckland to some drizzle and heavy clouds. Not to worry the rain stopped and four smiling faces greeted us with Peter holding up a MG umbrella with MG Octagon motif just for good measure. After the initial greeting and introductions we then had a short walk to the bus which Ian was able to book for the day and we set off to see the sights of Auckland in very safe hands. Some of our fellow passengers on the ship were rather envious but I did mention what “Safety Fast Pete” had told me and I suggested that they buy their own MG! Meanwhile back in the bus; we went on a drive through some of the downtown areas and out to see a lot of Auckland Bay and then to a little coffee shop for a chance to get to know our hosts for the day. All were happy to chat with the main link being the MG’s, the respective MG Car Clubs and in particular the often maligned MGC. I had asked our Regalia Officer, Geraldine Hough, for advice on what was suitable in the way of regalia to give them and they were all really chuffed to receive something that none of their other Club members would have!, So a big thank you to Geraldine, Well done! Ian Grant then drove us up a very steep winding single lane to the top of Mt Eden but unfortunately we ascended into a pea soup fog so had to turn around and come back down to the lower levels to see Auckland at all. Given the weather it was decided to give the tourist bit a miss and head for lunch at a little pub they knew about, The Northcote Tavern, which was just what was needed to have more of an opportunity to hear how their challenge was progressing; to find out where all the MGC’s were in New Zealand, quite a challenge indeed. They do have the initial records of delivery however some have either disappeared or changes have occurred plus like here in Aust. There have been imports from America. After we had had our meal because of the weather it was decided to go directly to Ian & Joanna’s home for a chance to see their “C”s so after a bit of a drive through a number of suburbs we pulled into Ian & Joanna’s driveway and while Jan went inside for a break from the MG talk, I was asked if I wanted to have a look at their MG’s; well you know what my reaction was no doubt and some three-quarters of an hour later we returned to the house. Parked under the carport was Peters white C GT and in the garage was Ian’s red C Roadster. Both absolutely pristine machines which would both fare well in any Concours. Peter’s car came to NZ when he immigrated from the UK. Fine original examples of the marque and which I am sure will serve them well for many years to come! The roads here are very similar to our Adelaide Hills roads ideal for MG’s with lots of winding and tight corners. Jan & I felt that we had been welcomed so naturally and it was hard to leave our new friends but we had to as the people on the ship get a bit paranoid about us being back before the ship sails! Ian & Joanna drove us back to the boat in plenty of time after a really wonderful day in Auckland. So thank you to Peter & Raewyn and Ian & Joanna for a lovely day of friendship and talking a lot about the cars we love! I suggest that if you are heading overseas perhaps you too may do what Jan & I have done and also enjoy meeting other MG Owners along the way during your travels and take on board those two little letters:- M & G.
Race shown on the big screen. Sausage sizzle lunch and Bar open. Dress in your favourite teams gear. A cool night with no rain welcomed us at Kart Mania. 26 itching and raring people were ready to go karting. Unfortunatley we were douyble booked and had to wait an hour to get on the track. This gave us time to catch and chat about the karting and other MG activities. The group divided themselves into pairs for the karting (see table below). 40 minutes. Congrats to Geoff Bowra and his mate Simon for completing 60 laps in the fastest time and getting the 1st place trophy. Burls provding spector support to the group. Many thanks to all for attending and hope you enjoyed yourselves. Twenty members and friends joined in the pleasantries of this unique winery / tasting venue. Our ever charming Hosts, Dean and Di once again provided us with an amazing afternoon of food and wine. The surrounds were spacious and relaxed, with an abundance of different styles of food to choose from. Two tables of ten were just perfect, so the conversation flowed freely throughout the day. The wet weather did not deter anyone from arriving. Many of the wines on offer had won Bronze, Silver and Gold awards in 2013. A day with a difference spent in Unley on an Autumn afternoon in Adelaide. Thank you so much for everyone who came along. As this was the last social event for my position as Social Secretary of the MGCC of SA I would like to say ‘Thank You ‘to all of the members who attended events throughout the last year. I appreciate your continued support. The warmth of the early morning sunshine was an indication for a wonderfully enjoyable and relaxing day ahead spent meandering through the colourful and picturesque Adelaide Hills. Thirty two members attended the Luncheon at this very interesting and unique venue. Housed in the old Onkaparinga Woollen Mills, (once very famous for their quality woollen blankets). The walls and shelves are adorned with memorabilia from days past. Standing proud, up high above the vaulted ceiling, is a motor cycle suit bearing the number 32, which we were told was worn by a local person who participated in the Lobethal Re-enactment some years ago. The suit is from the 1930’s era. All of the operations of the distillery are housed behind large glass walls, and the samples of beer were on wooden ‘paddles ‘of 8 small tasting glasses. There is a tasting corner tucked in to the side of the very busy and very popular restaurant. The meals were served in a timely and friendly manner, and on all accounts were enjoyable. Several of our members decided to soak up the afternoon sun out on the forecourt of the entrance to the building. A perfect place to end a Sunday drive. Thank you to all who came and enjoyed the day. Our visit began with being greeted and escorted by a Security Guard (All 14 of us) through to the inner sanctum of the well-known and well-loved ABC Building in Collinswood. We met for morning tea to begin our day in the ‘Tregenna Café ‘. After that we were greeted and welcomed by our two very experienced and friendly guides. The staff café takes its name from ‘Tregenna House ‘. A stylish and somewhat handsome late Victorian Villa built in c1890. The home was opposite the present building, on the corner of Galway Avenue, believed to be a Doctor’s residence. It was demolished in the early 1970’s when the now ABC building was constructed. It is interesting to note that this building was designed to be a Hospital, but never became so; hence the design is typical of a Hospital, from that era, with very wide passage ways, and all rooms being very plain and square. There are eight floors to this building, only six are occupied by the ABC. Now time to commence our Tour. Not enough room for everyone in the small lift, so it was head for the stairs. Five of us brave ones took the six floors by foot; myself, Barb Harrington, Gayle King, Gary Davies, and Linda Byass. Our first Guest speaker was a delightful and cheerful David Bevan. He told us all about the breakfast program he has with Matt Abraham; apparently, they have been long-time friends. He remembered when Digital Radio began in the 1990’s.Three hundred and fifty people are employed at the ABC building in Collinswood. The hub of everything is the secure Journalists room. This looked like a very busy Bee Hive. Next it was onto meet Ian Henschke, and his staff. A long and interesting chat was held with him, in-between his announcements, and the 11.00 news. He mentioned our presence on air, and spoke to Chris Kinney about the road closures for the Bay to Birdwood event. The day was a significant one, as the permanent closure of Holden Manufacturing in Australia had just been announced. We viewed sound proof recording rooms, orchestra recital rooms, the library room, where all music is stored and selected for programs, production for television studios,even the tiny main newsroom, which looks glamorous on TV, but not in this studio. There are no longer cameramen filming, now all done by remote control small cameras. The news desk is rather basic. The ABC began its life in Adelaide in Hindmarsh Square in 1932. It certainly is a great place to visit and also a great hall of fame. After our extensive 2/ ½ hour tour, it was time to thank our guides and head back to the Tregenna Café, where we were all keen to enjoy a welcome lunch and a cup of coffee. Thank you so much for all who attended and enjoyed the day. KOPPAMURRA WINES at 32 UNLEY RD, UNLEY South Australia 5061. Cancellations no later than 4 Mar 2014 to Jeanette.